Stoic in his mother’s arms, the toddler stared ruefully at the blood oozing from the gashes across his small hand. He extended the hand limply as mother and child waited next to a dilapidated white Toyota LandCruiser that would carry him to lifesaving medical treatment. The morning had begun calmly at Olmoti Clinic, with the launch of a two-day visit by Dr. Richard Nkambi and his ophthalmology team. 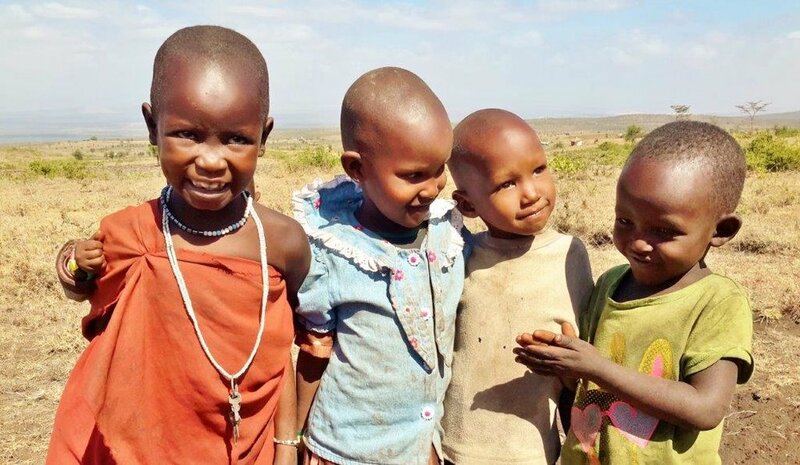 They would see vision-impaired older adults, trachoma-infected children and other Maasai who were gathered outside. Olmoti children receive the rabies vaccine. Dr. Nkambi was ushering people into the exam room, after screening them with an eye-chart in the outdoor hallway, when a trio of motorcycles roared up. A handful of adults carrying children climbed through the storm of dust. They rushed into the clinic and blurted out the horror of the morning. These five children, and two others at home, had been bitten by a rabid dog. Jumbled details emerged -- importantly that the dog was no longer a threat: it had been killed. The children on the other hand were in dangerous limbo. They needed rabies vaccine – and quickly. To prevent infection of the nervous system, treatment must begin as soon as possible. It was already more than three hours since the kids had been bitten. But the government-supplied medications at Olmoti Clinic did not include rabies vaccine. The nearest hospital with the life-saving drug was nearly two hours away by car. For the Maasai, the trip would be problematic, dusty and painful by motorcycle, with the added complexity of navigating the medical facility. “I will take them. “ Dr. Salash Toure, the former Arusha regional medical director and now an advisor to Olmoti Clinic, stepped up. Toure happened to be visiting the clinic this day in his oversight role. Not only could he seat the children and their parents on the benches in his aged Land Cruiser, but he’d quickly penetrate the hospital bureaucracy and translate explanations from Swahili into the Maasai language. Arrangements now were made by phone to pick up the other two children on the road. Winds gusting around them, the five bitten youngsters and their parents clambered into Dr. Toure's vehicle. But for the shrieks of one baby, they were quiet as the Land Cruiser rumbled away in a swirl of red-brown dust. Once at the distant hospital, the kids received a vaccine dose. But the rabies regime would require four additional injections on specific dates. Dr. Toure carried the follow-up vaccine back to Olmoti Clinic and directed the grateful families to make sure their children completed treatment there. It had been a close call for the Olmoti community. Dr. Toure wanted to ensure the next time wouldn't be such a cliffhanger. Calling the district medical officer, he requested a rabies vaccine supply with the next shipment of medicine to Olmoti Clinic. It arrived the next day.